In response to tremendous demand for The Messiah Complex, BRIC is pleased to announce an additional performance on Friday, May 27 at 8pm. Unfortunately, due to scheduling conflicts two performers in the production are unavailable, so the performance has been changed to accommodate their absence, and in this way does not reflect the intended vision of the director or the fullest vision of the creative team. We believe that the strong work of the group remains worth sharing and look forward to welcoming you to BRIC on Friday night. Written by Nia Witherspoon, directed by Charlotte Brathwaite, choreography by Ni’Ja Whitson, dramaturgy by Cherrie Moraga, original music by Justin Hicks, and set/lighting design by Tuce Yasak. Performed by Mikel Banks, Marcus Brandon, Joel Daniels, Kirsten Flores-Davis, Anyanwu Glanville, Tiffany Salmon, Linda La Montanez, Shelley Nicole, Nabowire Stokes, Kirya Traber, Tanisha Thompson and Ni’Ja Whitson. On Wednesday, May 25, the performance will be followed by an artist-audience dialogue moderated by Darnell Moore. Moore is Senior Editor at Mic, co-managing editor of The Feminist Wire and Writer-in-Residence at the Center on African American Religion, Sexual Politics and Social Justice at Columbia University. NIA WITHERSPOON is a multidisciplinary Brooklyn/Phoenix based artist investigating the social and spiritual realities of blackness, gender/sexuality, and intergenerational trauma. Working primarily in the mediums of theatre/performance, vocal and sound composition, and creative scholarship, Witherspoon’s work has traveled both nationally and internationally to venues ranging from theatres and universities to activist organizations and non-profits. Described as “especially fascinating” by Backstage Magazine, Witherspoon has been the recipient of multiple awards, including: Astraea Foundation’s Lesbian Writer Award and Global Arts Fund Grant, Downtown Urban Theatre Festival’s “Audience Award,” a three-month long Wurlitzer Foundation residency, Lambda Literary’s Emerging Playwriting Fellowship, a CASH Grant from Theatre Bay Area, and a Mellon Dissertation Fellowship. Her work for the stage has been featured at HERE, the National Black Theatre, BAAD, and the Painted Bride (Philadelphia), among various venues in the Bay Area, including The Lab, The Garage, La Peña, and Eastside Arts Alliance. As a performer, Witherspoon is co-founder of ceremonial music collective SoliRose, a world-premiere cast member of Sharon Bridgforth’s River See, which opened at Chicago’s Links Hall, and has been a featured vocalist in the work of Cherríe Moraga in La Semilla Caminante/The Traveling Seed (Intersection for the Arts). Witherspoon’s writing is published in the Yellow Medicine Review, and forthcoming in Women and Collective Creation (Palgrave), The Journal of Popular Culture, and Imagined Theatres (Routledge). Her most recent play, You Mine, commissioned by the Obie-award winning Fire This Time Festival, premiered in January 2016. Witherspoon holds a BA in American Studies from Smith College and a PhD in Theatre and Performance Studies from Stanford University. CHARLOTTE BRATHWAITE is known for staging classical and unconventional texts, dance, visual art, multi-media, site-specific installation and music events which have been seen in the Americas, Europe, the Caribbean and Asia. She recently conceived and directed the Obie award-winning Prophetika: an oratorio at La MaMa Theater in NYC which was celebrated as, “conceptual yet viscerally powerful,” by the Wall Street Journal. She has collaborated with choreographer Kyle Abraham/A.I.M. and with director Peter Sellars on several projects. Recipient: Princess Grace Award, Julian Milton Kaufman Prize, Rockefeller Residency, National Performing Network Creation Fund. MFA Yale School of Drama. 2013/14 Artist-in-residence Amherst College. Currently Assistant Professor of Theater Arts at Massachusetts Institute of Technology. NI’JA WHITSON is an award-winning interdisciplinary artist, performer and educator who been referred to as “majestic” and “powerful” by The New York Times. Recent awards include an LMCC Process Space Residency, Bogliasco Fellowship, Brooklyn Arts Exchange Artist Residency, two-time Creative Capital "On Our Radar" award including in its inaugural year, among others. 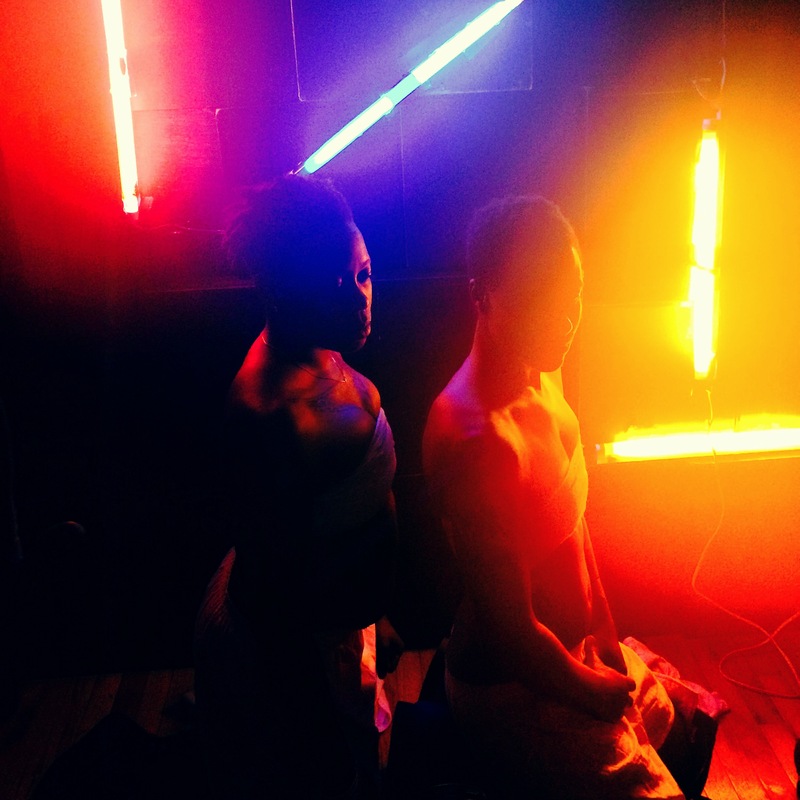 As a practitioner of indigenous and diasporic African ritual and resistance forms, they create work that reflects the sacred in street, conceptual, and indigenous performance. Proudly, they collaborate with notables in theatre, dance, visual art, and music including closely with Sharon Bridgforth and Douglas Ewart, and other leaders such as Dianne McIntyre, Oliver Lake, Edward Wilkerson Jr., Guillermo Gomez Peña / La Pocha Nostra, April Berry, Allison Knowles, Darrell Jones, and Baba Israel. Ni’Ja Whitson is currently on faculty at the New School for Liberal Arts and is the founder/artistic director of The NWA Project. JUSTIN HICKS uses music, sound and text to explore themes such as identity, economics, marriage, labor, and religion through compositions and performances that range from singer/songwriter-style presentations to interdisciplinary and collaborative works involving movement and set design. His work has been featured at Lincoln Center for the Performing Arts, Baryshnikov Arts Center, PS 122, The Japan Society, The Julliard School, The Knitting Factory, Jack, Arlene’s Grocery, Bowery Arts and Science, Invisible Dog, Culture Station Seoul 284, MoMA, NURTUREart, Dixon Place, and La Mama. Hicks was a performer and sound designer for The Geneva Project by Jennifer Newman and Charlotte Brathwaite (Jack 2015 & 2016), as well as the Obie Award-winning (Abigail Deville, design) production of Prophetika: An oratorio by Charlotte Brathwaite. His work The Odetta Project: Waterboy and the Mighty World was featured during Jack’s Freedom Songs Festival: Which Side Are You On, Friend? (Jack 2015). BRIClab is a commissioning and residency development program for both emerging and established local artists to explore and expand the possibilities of their work in music, dance, theater and multi-disciplinary performance.